It does not matter whether you engage in water sports or not, having a waterproof watch is extremely important. And more so if you regularly go for outdoor excursions like camping, hiking and fishing. You could be going for a hike and it suddenly starts raining. Or you could be hunting an animal when your watch accidentally falls into a stream. Fortunately, if you have the best waterproof watches, they will be able to resist water and any impact they’re subjected to. However, keep in mind that different watches will have different levels of water resistance. As explained in the article, some waterproof watches are only suitable for everyday use. Others, however, can be worn when you’re going for a swim. Let’s take a look at the top-rated waterproof watches on the market. When creating such a review, opinions will always differ. However, we strongly believe that these three waterproof watches stand out both from a functional and material point of view. Not only do they look impressive but they also serve multiple functions. Our top three picks are: the Casio G-shock GG-1000-1A5CR, Seiko SKX007K and the Casio MRW-200H. It’s important to note that no watch is every fully waterproof. Under certain conditions, each watch can take on water. The water resistance feature of watches is tested in laboratories. The tests mimic the conditions that a watch would encounter under the water. This includes the depth of water as well as the water pressure. Ideally, the deeper you go under the water, the higher the pressure; hence, the harder it is for the watch to resist water. 3 ATM means it’s good to wear when washing your hands, walking in rain and a light shower. 5 ATM means it’s suitable for a shower or bath. 10 ATM means it can be worn to light water sports. 20 ATM means it can be worn to snorkeling. You should also check the material used in its construction. The material is what determines important factors like leak-tightness and longevity of the watch. Experts recommend buying watches made of stainless steel or other corrosion-resistant allows consisting of steel. The wrist band should also be made of water-resistant material. Casio is one of the most renown brands in the watchmaking industry and it’s easy to see why. They offer medium-priced wrist watches that have such incredible features. The Casio G-Shock Series is so far, the most noticeable and it comes at you with everything it’s got. From a glance, this watch is bigger than the majority of G-Shock offerings. If you measure it, you’ll notice that it’s 56 by 55 by 17 millimeters, meaning that it’s a sizeable watch. On the brighter side, legibility is one of the strong aspects that this watch has going for itself. It has very big Arabic numerals at the 12, 3, 6 and 9 o’clock points. When it comes to the bezel, the G-Shock is labeled with the 360-degree metric, which makes it easy to interpret the compass readings. This watch is designed to tackle everything you throw at it; whether it’s wet, cold, hot or muddy conditions. 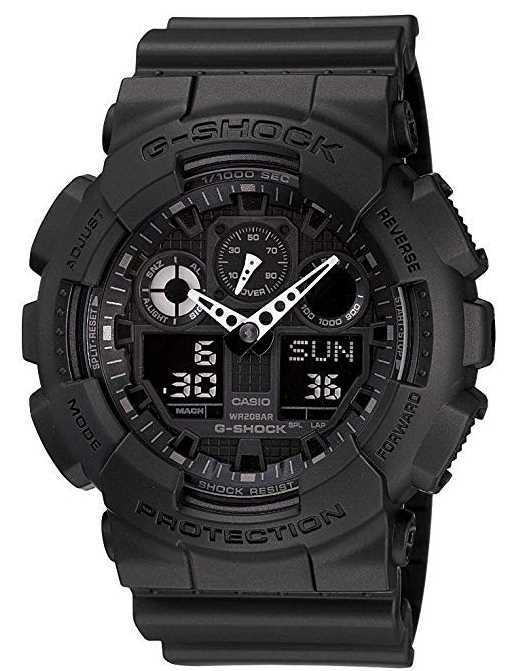 This is made possible by the GG-1000’s shock, mud and water-resistance structure. Speaking of its waterproof capability, this watch has a rating of 200-meter resistance. 200-meter water resistance; hence, suitable for marine activity and surface water sports. Equipped with a digital compass. Comes with triple sensor capabilities, which measure atmospheric pressure, altitude and direction. Summary :- Owning the Casio G-Shock is the best way to treat yourself to a truly multi-functional watch. Whether you want to wear it on land, air or at sea, this watch can withstand every harsh condition. If you prefer a waterproof watch with automatic movements, the Seiko SKX007K is an excellent option. For the long time that this watch has been around, it’s been praised for its robust build, durability and chic design. The first thing you’ll notice about Seiko Analogue Watch is that it looks and feels solid. This is thanks to the stainless steel construction that can withstand bangs, abrasion, and knocks fairly well. It has a bold look, which should fit most men’s styles. The case has a diameter of 42.5mm with a thickness of about 13.25 mm. As for functionality, Seiko SKX007K is simplicity at its finest. It’s fitted with a basic dial, which serves the main function of showing time. Plus, the base is colored in matter black while the hour markers are colored in white. The black and white color schemes contrast nicely, enabling you to read the time more conveniently. Like most watches by Seiko, this one also has the patented LumiBrite feature, which is liked for its brightness and durability. The high quality makes viewing time in poorly lit areas much easier. When fully charged, the luminosity should be enough to last throughout a night. Has power reserve for up to 40 hours. Water-resistance to depths of 200 meters. Employs the Japanese 7s26 automatic movement; thus, eliminating the need for batteries. The rubber strap is made from low-quality materials. Summary :- What makes Seiko SKX007K watch stand out is its sturdy build. This is a particularly handy feature for outdoorsy users who are likely to subject the watch to accidental falls and abrasions. It is no secret that Casio makes exceptional analog dive watches, and their EAW-MRW-200H-1BV model is the perfect example. One of the selling points of the Sport Dive watch is its accuracy. Compared to other watches of its class, this one is definitely more precise. With +/- 20 seconds per month, you will be on time for all your outdoor activities and won’t have to readjust the piece regularly. This precision can be attributed to Casio’s user of the superior Japanese Quartz movement. Another feature worth noting is its water-resistance. 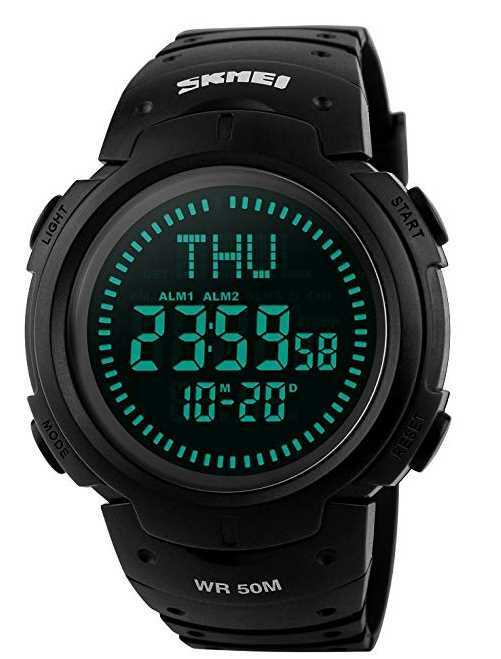 Aptly named a dive watch, the Casio MRW-200H lives up to its description. It has 100-meter water resistance, making it ideal for surface water sports. It’s fitted with a tough resin case that can withstand pressure increase. Coupled with the waterproof sealing, you’re guaranteed that no water will get through to its internal components. We also like the buckle of the Casio Dive Watch, as it locks tightly on the user’s arm. The band has a smooth surface that feels comfortable on bare skin. The mineral dial window enhances protection. Comfortable band with a secure closure. Offers day and date display. 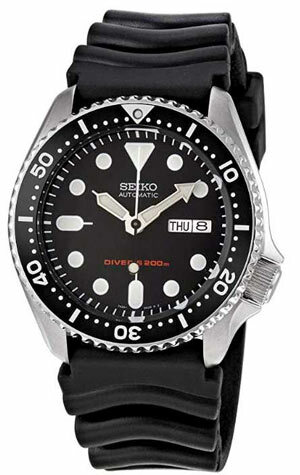 Though described as a dive watch, it does not have the best water-resistance. 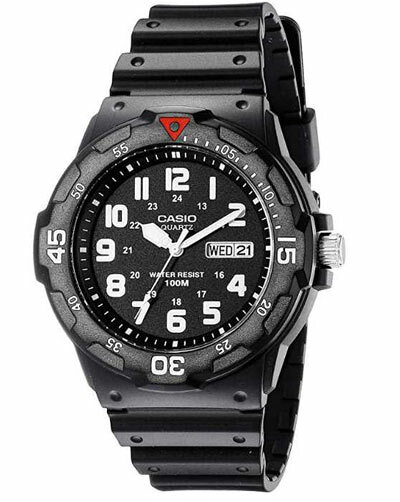 Summary :- Despite the lower water-resistance rating, the Casio Dive watch scores highly on several aspects. These are accuracy, reliability and versatility. As such, it’s a waterproof watch that’s worth investing in. For the outdoorsy people who love to go camping and hiking, the Casio Rangeman is the perfect outdoor watch. You probably don’t know this but the Rangeman was the first Casio watch to be fitted with the unique triple sensor. This consists of an altimeter, barometer and compass. The compass is marked in degrees and it shows direction. The barometer determines the atmospheric pressure while also notifying you of changes in case there’s an upcoming storm and the altimeter shows your current altitude. The sensor is also very easy to navigate by simply pushing the middle right button. Like most watches by this brand, the Rangeman also has water resistance of up to 200 meters. The only drawback is that it that it’s quite big. At 2.1 by 0.7”, this watch looks massive on any wrist size, but it wears pretty well and feels comfortable. A good number of sensors that will please even the pickiest outdoors person’s needs. Excellent design- tough, rugged structure that withstands shock and abuse. All-round good watch for the price. Bigger than what most people would want. Summary :- For a reasonable price, the GW9400 Rangeman is an effective watch that can withstand all of the elements an outdoorsy person is likely to encounter. One of the reasons why some outdoorsy people do not like to wear watches is because they’re bulky. If you factor in all the other gear that they have to carry around, most prefer to forego this accessory. Thankfully, the Promaster was designed with weight in mind. It’s so lightweight, you’re likely to forget that you are wearing it. The Promaster Diver has a thickness of 12mm, which is one of the aspects that contributes to its light weight. Though it has a slim profile, it’s somewhat big in size featuring a diameter of 43mm. This watch has a dark blue dial, which is complemented by the dark blue polyurethane band. It also comes in a black dial/black strap model, although the former looks more stylish. Regardless of what color you choose, the Promaster is powered by the Eco-Drive E168 movement. This is a revolutionary piece of tech that enables the watch to charge itself using lighting; be it indoor light sources or natural sunlight. Better yet, this watch is fully resistant to water depths of 200 meters. This makes it perfect for the adventurous, who love to go fishing, kayaking or surfing. Boasts a durable and quality construction. The dark blue color scheme gives it a unique look. The incorporation of a polyurethane strap comes in handy as it’s also water-resistant. Some users experience difficulty reading the date display. 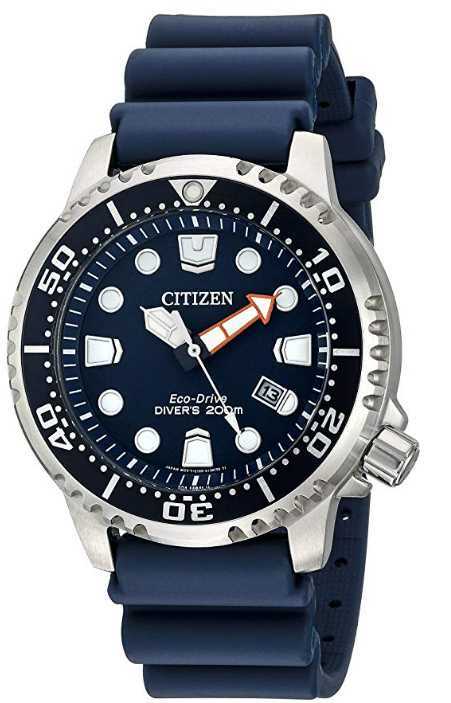 Summary :- The Promaster Diver Watch by Citizen is one that can operate efficiently underwater at up to 200 meters depth. It uses light powered Eco-Drive technology, which means you’ll never have to buy batteries. And it has a slim design that makes it lightweight. Megir Mens Sport Watch has all the functions you’d need in a waterproof watch for outdoor activities. The watch is available in several colors including brown, black, gold and brown/white. This makes it perfect for all occasions. Unlike other waterproof watches that come with PU bands, this one has a strap made of leather. This is the aspect that gives the watch a classy look. 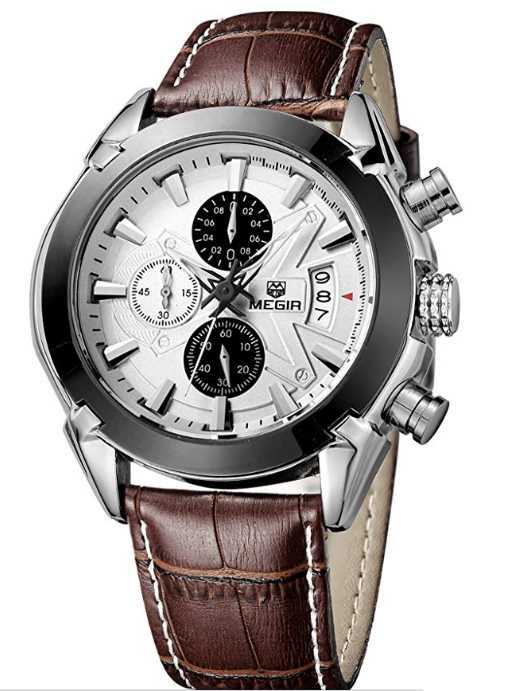 Megir Sport Watch uses Japanese quartz movement, which means it’s very accurate. It also has an analog display and protective mineral crystal that shields it from scratches. The diameter of the case is 47mm with a thickness of 14mm. The length of the strap is 8.78”. For those with small wrists, you might have to add more holes to the strap. With regards to functionality, this watch can do a lot more than tell time. More specifically, the watch is fitted with a calendar, which displays dates. It’s water-resistant up to 30 meters, meaning that it can only withstand splashes and rain but not submersion. The leather strap makes it durable and stylish. Has Japanese quartz movements for precise timekeeping. The water resistance is rated at only 30 meters. Summary :- Megir is a leather sport watch, but nowhere as pricey as your brain might be telling you. It’s very affordable, and is water resistant to up to about 100 feet. If you’re looking to buy a watch for the purpose of gifting someone, SKMEI Compass Military Watch is just what you need. It has a fashionable military design and offers tons of digital functions. One of the best things about this watch is that it uses the original Japanese movement. This ensures that it provides precise time. Other than time, it also shows the date, week and month of the year. Plus, it doubles up as a stopwatch timer and since it has a shock resistant, it’s great to use both indoors and outdoors. Another perk of this watch is that it’s water resistant up to 50 meters, which means it can support daily waterproof activities like taking a shower or withstanding a few splashes. However, if you plan to go scuba diving during your outdoor excursion, you should not wear this watch as it’s likely to get damaged. Comes with a thickened case to withstand impact. It has a cool sporty design. Not designed for extensive underwater activities like swimming or diving. Summary :- The Men’s Military Watch may not have all the bells and whistles that other watches contain. But, it has a decent pricing, provides accurate timekeeping and is slightly waterproof. 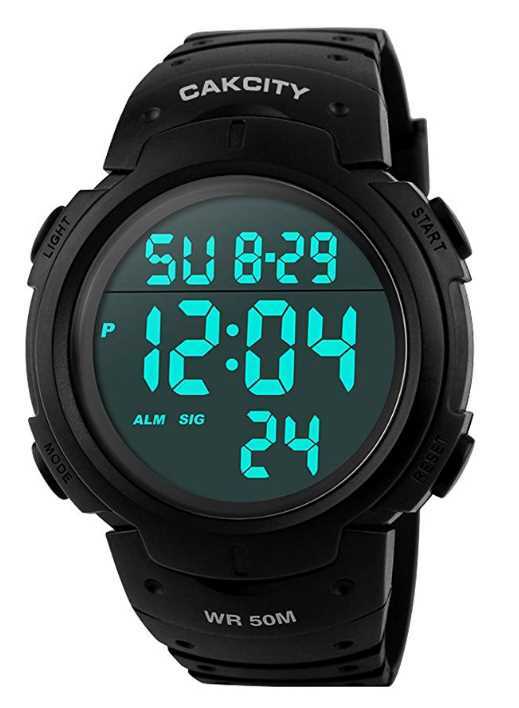 If you’re a sporty person, you’ll want to get a durable waterproof watch like the CakCity Digital Watch. 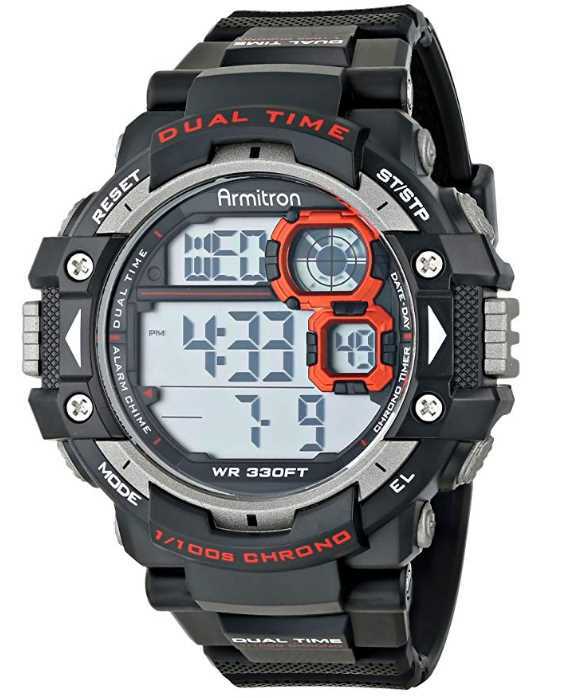 This watch is recommended for every sporting activity; from running to fishing and hiking. The most noticeable feature of CakCity watch is its sleek design, which makes it suitable for sporting activities and more. You can wear it to accessorize your outfit or for its functional purposes. The manufacturer has stuck to a simple yet exquisite design by only incorporating the word ‘CakCity’ in white at the top. But what you will like most is how comfortable the band feels; plus, it’s adjustable. When engaging in outdoor activities, it can be hard to use a watch that has a small face. Fortunately, CakCity has taken this into consideration, which is why this particular model comes with a large LED screen. The diameter of the case is 47 mm providing ample room to install large digits. As already mentioned, CakCity digital watch is highly durable. It’s shock-resistant, a factor that allows it to withstand impact. More importantly, the watch is water-resistant up to 50 meters. Given the low water-resistance rating, you can only wear this watch if you’re taking a shower. But if you’re going for a swim or snorkeling, you might want to remove the timepiece first. Fitted with day, date, alarm and stopwatch function. Has a PU band which is soft to wear. Has a shock-resistant case; suitable for both indoor and outdoor use. The 5ATM water-resistance rating is only ideal for daily activities but not water sports. Summary :- If you’re looking for a simple and budget-friendly waterproof watch, the CakCity Men’s Watch is not a bad choice. However, keep in mind that it’s only water-resistant up to 50 meters. Looking for a waterproof watch that is durable enough for extreme outdoor activities? 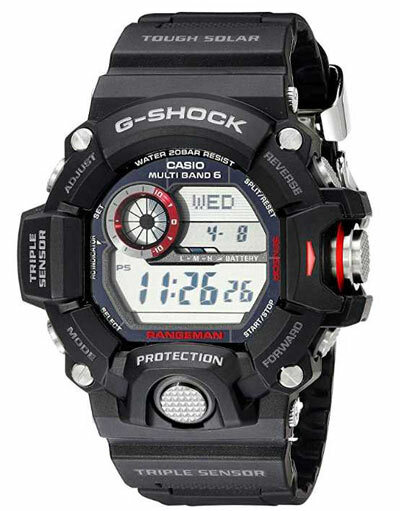 Casio G-Shock GA 100-1A1 is worth taking a look at. ​The design of this watch is as esthetically pleasing as it is long-lasting. The case of this watch is structured in a way that helps it withstand anything you throw at it. With attributes like water resistance of 200 meters, magnetic resistance and shock resistance, this watch is perfect for your outdoor excursions. Another feature worth mentioning is the accuracy of this watch. It has an accuracy of +/- 15 seconds per month.You will also like the numerous measuring modes that include split time, elapsed time, lap time and selection distance output. These modes allow you to track your progress even in the toughest conditions. Water resistance to a depth of 200 meters. Has world-time functionality; shows the time in 48 cities within 29 time zones. Offers both analog and digital time. It lacks the solar-powered capability included in some G-shock watches. 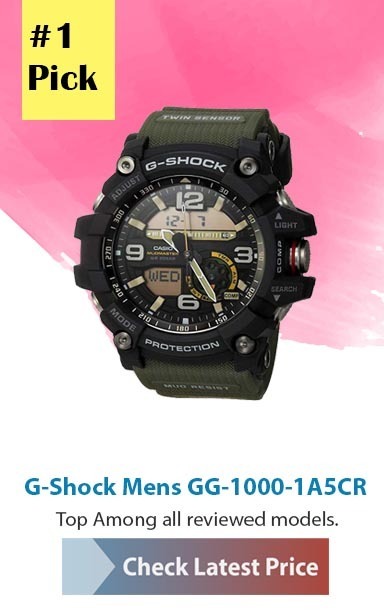 Summary :- By now, you know that Casio are pros in making durable and highly-functional watches, and the GA 100-1A1 is no exception. Almost five decades ago, Armitron started making the first affordable digital watches. Currently, the company continues with the same spirit of making bold, durable wrist watches like the Men’s Chronograph Watch. ​As described in its name, the Armitron is a chronograph watch. In other words, it doubles up as a stopwatch and display watch. A basic chronograph watch like this one usually has independent sweep second hand. This means it can be set, stopped and reset to zero by placing successive pressure on the stem.Furthermore, this is one of the few waterproof watches that comes in an array of colors. It’s available in black, grey, black/blue, black/orange, black/teal and navy blue. The resin case has a diameter of 54 mm, meaning the watch is on the bigger side of the size spectrum. On the positive side, it has water resistance of 100 meters and is fitted with a textured resin band that feels comfortable on the skin. Uses quartz movement; hence shows precise time. Cannot be used for scuba diving or any other form of diving. The auto LED light is a bit dim; making its visibility under certain conditions difficult. Summary :- If you’re looking for a waterproof watch that you can wear when swimming and snorkeling but not diving, the Chronograph Watch by Armitron is a nice option. It’s water resistant to 100 meters and comes in a wide range of colors. We tested dozens of waterproof watches over the course of one month to see which ones withstand wet conditions best. We tested these wearables under two main conditions. One, when doing light activities that involve water such as washing our hands, washing a car and a few splashes. Two, we tested them under more intense water-activities such as swimming and surfing. 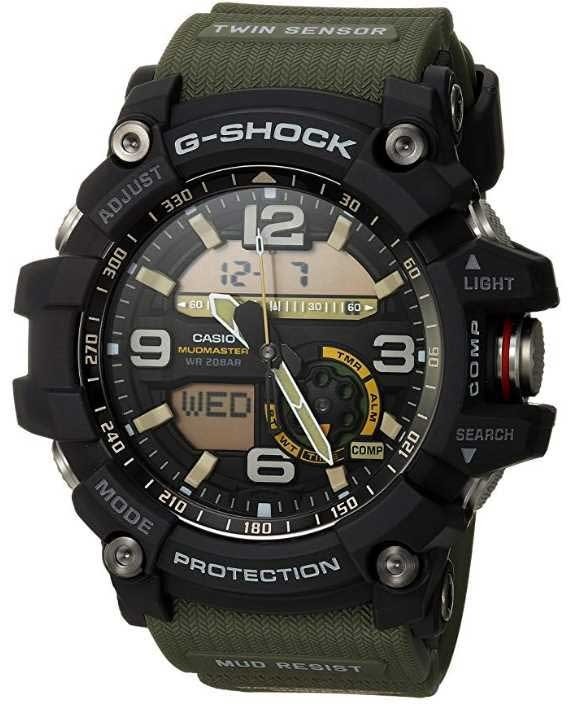 Based on our research, the Casio G-shock GG-1000-1A5CR fared well in both situations. Not only was it resistant to depths of 200 meters but it was also able to withstand hard impact when dropped to the ground. This is why we ranked it first in our best waterproof watches list. At times, the thought of spending chunks of money on a high-end watch can be overwhelming. Why spend all that money when you can get a fairly similar watch at a cheaper price? Here are a few reasons why you shouldn’t buy a replica watch. It’s illegal- it doesn’t matter whether you’re buying or selling a fake watch. Doing so means you’re a participant in the black market, which is illegal in most countries. It could be seized – you’d be lucky if the only way you pay is by suffering an embarrassment when it’s discovered that you’re wearing a fake Casio G-Shock Series. At worst, the watch could be seized and confiscated, which will be a waste of your money. It doesn’t last – even if it’s not seized or you’ll able to cheat several people that you’re wearing a Rolex, that watch won’t last long. Fake watches have very short lifespans because they’re made from inferior materials. If you’re doubting the authenticity of a particular watch, there are a few tricks you can use to establish whether it’s a replica. Listen for ticking – this is one of the biggest signs that the watch is a replica. A high-end watch will consist of thousands of perfectly-crafted mobile elements so it shouldn’t tick at all. Look for obvious mistakes – misspelt words of the brand, scratches, dents and peeling paint are all red flags. Also, if the watch keeps losing time, it might not be the real deal. Check the quality of letters – the best watchmaking companies pay a lot of attention to the lettering. Thus, a genuine watch will have letters that are clear and legible. How do you clean and maintain a waterproof watch? Use an eyeglass or watch cloth to remove dust and fingerprints from the lens. You can also check for scratches while you’re doing this. Examine the whole case thoroughly, being sure to remove grime from the outline of the case plate. How is a waterproof watch different from the rest? Answer : If a watch is described as waterproof or water resistant, it means that it’s engineered for water usage. These types of watches will have very few openings, which can allow water to permeate. In fact, they have extra heavy gaskets around the crystal. Depending on the water-resistance rating, you can wear the watch when going surfing or boat diving. Do waterproof watches last longer? Answer: Yes, they are. Most of the waterproof watches are also designed to be shock-resistant. This means they can withstand a good amount of impact. That said, you should keep in mind that the watch’s water resistance will deteriorate over time. In other words, a five-year old watch will not have the same resistance as a brand new one. When purchasing a watch that you can wear to water-related activity, you should always check the water-resistance rating. Also, you should keep an eye out for traders that try to sell you replica watches. Before buying, listen for ticking and check the engraving of the letters to determine if they’re genuine watches.